I transferred to a Level II nursery last summer, after working for over 12 years on Mother-Baby. It's taken lots of attempts over several months, but finally was able to do a successful IV blood draw the other day. I assist and observe whenever I get the chance with skilled co-workers - on some of our premies even they aren't able to get a decent specimen, so I don't take it personally when I've had unsuccessful attempts. My main issue is that I know my skill level is novice, and I feel like I'm torturing the baby if I can't get it on my first attempt, especially if I already know that they are a "difficult poke". I've never seen anyone use the transilluminator for venous access, I may have to try that while I'm working on my skill level. Thanks for that suggestion! My postpartum position was eliminated due to cutbacks and hiring LVNs. In hindsight, moving to the NICU was the best decision for me. 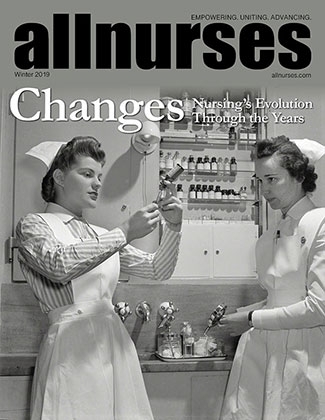 Previously, it was routine to have 4 couplets, a couple of discharges and admissions daily, but once the LVNs came in with their narrower scope of practice (stable/predictable patients only) sometimes the RNs would have to switch-a-roo their assignments if an LVN's admission wasn't stable or a patient became unstable - all the "heavy" and complicated patients were assigned to the RNs. It was so stressful that there were days I'd drive home crying because I felt like I couldn't keep up with the demands, and I have over a decades' worth of experience. Staffing is a joke... our call-ins were low priority compared to the ER and ICU, so often we worked short, and absolutely no wiggle room for overtime or a lull in the census; as soon as we had shuffled out the discharges, usually someone was sent home without regard for what was happening down the hall. I am loving the NICU. Three babies, tops. No chance of LVNs coming in. No taking report in a war-zone surrounded by other nurses, students, residents and docs coming in to rip charts away from you. I go home on time more often than not. I feel like I've done my job at the end of my shift, and not missed anything. If you're looking for a change... look at the NICU... it's a bit of a learning curve from postpartum, but it's been great for my morale. I'm hoping that management won't pounce on this and impose old-school bans on napping on your breaks at night. They absolutely hate that we do, but for some people it's the only way they'll be able to drive home safely after their shift. I'd hate to see one of my colleagues get in an accident and be charged with impaired driving after a few 12 hour night shifts in a row. It sounds as though you may have been too busy with your education to document the negativity around you. If you can prove that you were singled out (hard to do without the documentation to back it up) and were the victim of "mobbing" (bullying in the workplace by co-workers and management), then you may have some grounds to file a counter-claim. "Constantly being written up for small mistakes" sounds as though someone had an axe to grind against you, and enlisted the aid of others in documenting the small mistakes. Let's face it - honest mistakes happen to everyone. I wonder if one of your colleagues was the ringleader in this process; someone who may have been jealous of your efforts to advance your career, and wanted to "put you in your place". You should have the right to view all the complaints and incident reports in your file. They would have to be anonymized (dontcha love how complainants are protected by the system and aren't required to look you in the eye while they stab you in the back?) and you should have had a fair opportunity to respond to the allegations against you. Get an attorney. This sort of thing stays on your professional record. Nobody should be allowed to slander you, and if you don't dispute it, it may end up "appearing" that you agreed with the charges against you.